Monastrell still glistening after 4 months in storage. Onions (Allium cepa) are biennial members of the Amaryllidaceae family and Allium genus which also includes leeks, garlic and chives and shallots. They are an important food crop worldwide, and feature in the cuisine of many different cultures. Numerous varieties of onions are available. Most are easily grown, but not all varieties make good bulbs at this latitude so it pays to understand the specific requirements in order to meet with success and not to waste time, money and effort planting varieties which are not likely to do well. The most important criteria for growing onions is the length of daylight available. This is called photoperiodism. Onions grow foliage during the cooler weather – each leaf representing one layer in the bulb - until a specific daylight length is reached. 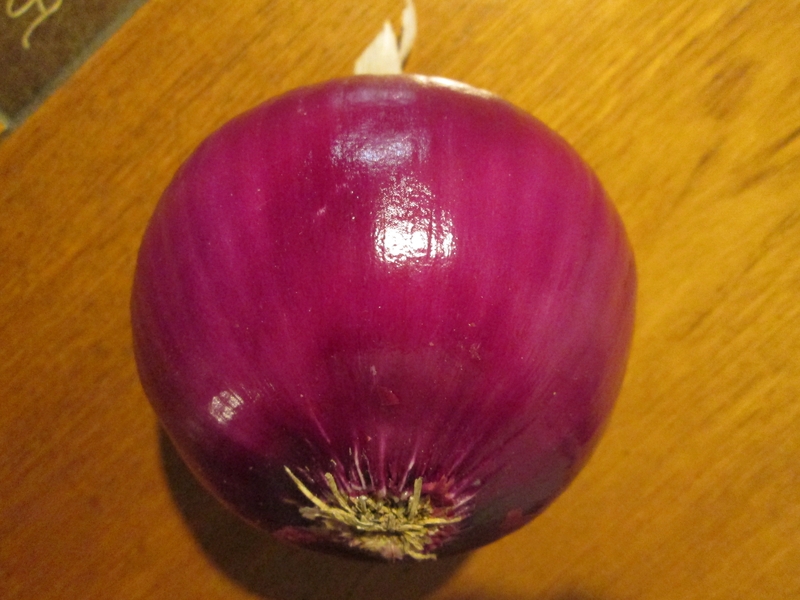 Once this point has occurred, foliage growth stops and bulb formation begins, so the larger and stronger the plant is at that point the bigger the mature onion will be. If you plant the wrong type at the wrong time they will grow tops but not produce onions, or will simply bolt and flower. Short day onions bulb up when the daylight length reaches 10-12 hours. (Note: This is in spring, and NOT when the days are getting shorter)! These are best started in the fall or early winter so that they can bulb up early the following year – they will be ready to use around late May -July. They are hardy, and overwinter well, although one has to remember to maintain irrigation and not let them dry out at any time. These are generally the sweeter flavored onions and do not store well. Intermediate day onions which are not so temperamental and will bulb when the light length is about 12-14 hours. In this area, if seed is started early in the year (January), or transplants are planted out in February they will have several months in which to grow into good sized plants by the time bulb production begins. This will enable them to develop quite large bulbs which can then be dried and stored by the end of August/September. Long day onions that require 14-16 hours of daylight in order to bulb up. These grow well in the north of the USA but do not do well in this area. In general, they are the more pungent varieties and tend to be the better keepers. An exception to this are the Walla Walla onions which although technically they are long day onions can be grown in intermediate day areas with good light since they mature early. These are very sweet onions and do not store well. Onions can also be further divided by color of their skins -- yellow, white or red, or by their taste -- sweet, pungent, or mild. Each daylight length group contains a variety of these possibilities. Some store well, while others only keep for a limited amount of time. Mature bulbs vary in shape and size conical, round, flattened disc, and some, such as the Cippolini types, only grow to 2”, while some aficionados attempt to grow individual onions weighing over 10lbs! The Egyptian "walking onions" (Allium × proliferum) make clumps of bulbs at their bases which are rather pungent. Clumps, which are more generally eaten, also appear on the end of stalks in place of flowers. If left, these flower stems bend over and the bulblets will root when they reach the ground. This is why they are called walking onions. Onions germinate and grow easily from seed. January is a good time to sow intermediate-day onions inside, or alternatively, transplants become available a little later. These often come in large bundles of single varieties which makes it difficult to try several different varieties in the garden unless one has a lot of space. I have had good luck growing the variety 'Candy' but although they had a very good yield and flavor, they did not store well. It was disheartening to find their middles softening before I had used them all. Recently I have grown 'Zoey' as a good storing yellow onion, but they may be rather large for some people -- many weighing in at nearly 2lbs. each! For red onions I like 'Monastrell', a slightly flattened onion with a good flavor, beautiful color, and excellent keeping ability. I harvested both these varieties at the end of August last year, and am still finding them in excellent condition as I am about to sow a new crop. A onion problem diagnosis chart can be found at the bottom of this document. Onions are a great crop in our area and are certainly worth growing.